The Nights of Reckoning expansion contained so-called rules cards. Each NoR booster also contained one rules cards (from a set of five rules cards) describing the new rules for the set. For added use in draft or sealed play, each rules card also doubled as a library card as indicated on the card when turned upside down. Initially these cards were not allowed as part of decks in constructed tournaments. But after some discussion in the VtES Usenet Newsgroup, a month after the initial release of Nights of Reckoning (on May 10th, 2006), the rules cards became legal for all V:EKN tournaments, both constructed and limited. Reference: Nights of Reckoning rules cards. Some basic (and mostly randomly collected) numbers on Vampire: the Eternal Struggle(VtES). A VtES card is approximately 63 x 88 mm in size (same as a Magic: the Gathering card). 1370 different crypt cards in total (although it is debatable how Raven/Camille Devereux is counted). 2136 different library cards in total. The “standard” booster contains 7 common, 3 uncommon/vampire and 1 rare cards. The “standard” starter contains 77 library cards and 12 crypt cards. The base set/expansion with the highest number of new cards is the Jyhad with 437 cards. The base set/expansion with the highest number of reprinted cards is Vampire: the Eternal Struggle with 430 cards. The base set/expansion with the least number of new cards isVampire the Eternal Struggle with 6 cards. There are several expansions (including Jyhad, of course) with no reprinted cards. The longest time between release of any two editions is 4 years 3 days (Sabbat to Sabbat War). The shortest time between any two editions is 1 month 12 days (Blood Shadowed Court to Twilight Rebellion). If you have any more (excluding those relating to card info (like number of clans, highest pool cost for a cards, etc.)) please let me know (using the Comment function below). This is the story of how Camille Devereux, the Raven became to be ..
Once upon a time, in the first VtES base set (first named Jyhad in 1994) a Gangrel vampire named Camille Devereux was included. Unfortunately the artist had used a photo of the model Stephanie Seymour as reference for his painting (to say the least), but without having asked for the permission to use the photo as such. 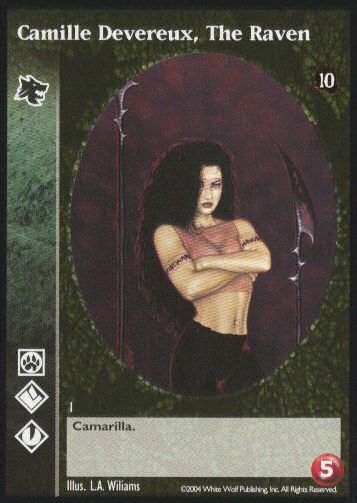 So in the re-release of the first base set in 1995, called Vampire: the Eternal Struggle, Camille Devereux was excluded. To fill the gap, the same artist made a new portrait and Wizards of the Coast (then publisher of VtES) released the Gangrel Raven who was identical to Camille Devereux except for the name. Until the release of the 10th Anniversary Edition (in 2004), it was even legal to have both Raven and Camille Devereux in your crypt. 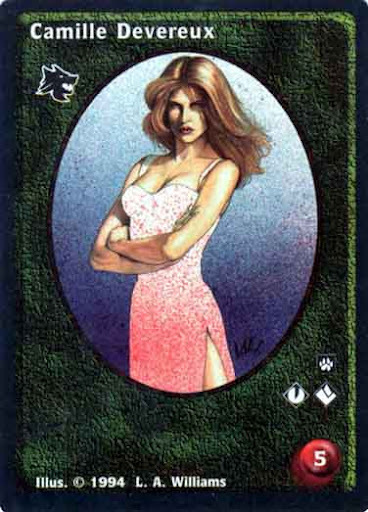 With the 10th Anniversary Edition a third card was released with the same characteristics as Raven/Camille Devereux, but with the name Camille Devereux, The Raven, and a new rule was added that the three aforementioned vampires now are assumed to be identical. That is, from these point on the three vampires contest each other as if they were the same vampire. The original Jyhad cards contained a number of quotes from various sources like music, movies or television, but unfortunately in a world of patents, copyrights and trademarks Wizards of the Coast forgot to ask the copyright owners in the first place. And because of these copyright infringements WotC had to replace a lot of the flavour texts on Jyhad cards in the followup expansion Vampire: the Eternal Struggle.